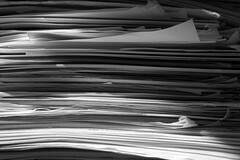 When I started full time paid employment in the later days of the 1980’s I walked into an office partitioned by large steel filing cabinets. Some of the filing cabinets had extra locks on them for security. Between the lines of filing cabinets were sets metal desks arranged in blocks of six. Each desk had draws down either side, a softer covering on the top and a chair. My chair was a simple wooden affair, others had arms. At one end of the main office were individual offices with dark wooden desks and leather chairs. It took me a long while to realise that you could define the organisation hierarchy by the type of chair and the location of the desk. My simple wooden chair and desk located at the end of a row and the end of the office defined me as the office junior. If I wanted arms on my chair I would need to get a promotion. My tools were paper, pen and a terminal. I didn’t have a terminal on my desk, no-one had a terminal on their desk. 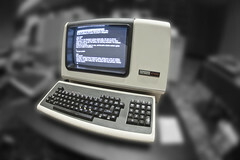 The terminals, both IBM 3270 type and DEC VT100 types, were arranged on a separate set of desks with a book at the end. The book was diary for each desk. If you wanted time on a terminal then you needed to book it. You also had to be prepared to have someone more senior to come along and take precedence. If I need to communicate with someone I had two choices – phone or walk. The only phone was the desk-phone which wasn’t called that back then because the mobile phone was something reserved for a limited few (who had arm muscles and a wallet big enough). It was clear where the people in the office spent their time and effort and it was processing paper. Everyone had cupboards and draws full of paper. The in-tray was the way that information was passed between people. If you did use a computer for a task it’s job was to produce paper. Sometime I’d go down to the print room and there waiting for me would be a whole box of continuous paper, normally the result of a mistake. Most of the paper, however, was still produced in the typing pool from written notes. Everything that went to the typing pool was thoroughly considered before it was sent because the last thing you ever wanted to do was to go back to them to ask them to retype something. There was a rumour that somewhere in the organisation they were starting to use something called the Personal Computer. A clocked-in and I clocked-out using a card which was placed into the machine. The cards where thus stamped with the time I came in and the time I left. At the end of the week I would add up the times on the card to demonstrate that I’d worked enough hours. The only work I did was between those two times. There was a computer services department, but that wasn’t where I started, I started as an engineer. Blimey, that takes me back. Amazing how things have changed. I used to fix those huge line printers as one of my first jobs. I loved that job. Laser were just coming onto the mainstream market too. My very first job after leaving college was at Kyocera, the laser printer manufacturer, (amongst other stuff), their 18ppm laser cost about £8,000! Happy days. Thanks for posting. ‘Huge’ is the right word. The engineering in some of those printers were amazing. The band printers would have a chain with all the characters on there which would revolve very fast then a hammer in the appropriate position would whack the correct letter onto the page as it passed. Making me think back now. Remember Daisy Wheel printers, oh yes and the Golf Ball ones. Didn’t like fixing those. I’m looking forward to Part 2, the 1980’s reminds me of going into work with my dad and either given the important job of filing! Back in the days when ‘filing’ was a job.